Rose quartz is the stone of unconditional love. This calm and soothing stone works on the heart chakra and opens it to all kinds of love; self-love, family, platonic, and romantic love. 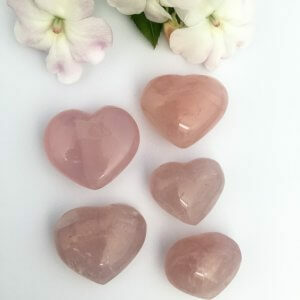 Rose quartz’s high energy can enhance love in virtually any situation. Rose quartz can lower stress and soothe those around it. It is used to increase self-esteem and self-worth. Rose quartz can also help dream recall and dream work. *Please note that this is a natural product and some crystals may display imperfections. Purchase this product now and earn 125 Crystal Points!